When Shobha Warrier met Eshwar K Vikas in 2013, he was waiting for his engineering results. But, by then, he had already become an entrepreneur. At a time when most young engineers were building software start-ups, this youngster was into manufacturing, making dosa machines for commercial purpose. Eshwar and his dosa machine were invited along with other entrepreneurs to meet Prince William and Kate, the Duchess of Cambridge when the British royals visited India last year. The royals not only saw how dosa was prepared, but William also tasted it and asked for the machine to be sent to the palace! Eshwar's venture, Mukunda Foods, has now developed another machine, Doughbot that makes chapatis on a large scale. He was one of the young entrepreneurs invited to share their concerns about the economy over lunch with Prime Minister Narendra D Modi and Finance Minister Arun Jaitley. Eshwar spoke to Rediff.com about how demonetisation and GST affected entrepreneurs like him. There is talk that the Indian economy -- especially the manufacturing sector -- is doing badly. How do you, a young entrepreneur from the manufacturing sector, perceive the current economic mood? Yes, the economy is going down and it is due to the confusion in the market. Yes. But the confusion is artificially created. Everybody is confused, so they are not buying new stock. They only want to distribute the stock they have bought earlier. When the distributor does not buy new stock, what will the manufacturer do? He is not able to manufacture new products. This has created a ripple effect in the economy. Are you, as a manufacturer, confused about GST? Personally, we are not confused at all. In fact, it is much easier for us to ship goods now. For example, earlier if we had to ship our dosa machines to Uttar Pradesh, we had to go to the local office, get the form and send it with the machine to UP, and the person over there had to take it to the local office. On top of this, every state had different types of forms, some states had octroi and VAT was different. But now, there is only one form, and we can complete the formalities online and send the machine. It is a lot easier. Purchases also have become simpler as we get credit on services. Earlier, around Rs 150,000 was our tax, but we never got credit. Today, we get credit on our Rs 180,000 tax. So, my cost of production will decrease in the long term. In fact, we have started seeing some benefits in our cost of production, but we have not yet started passing it on to our customers. In another 2 to 3 months, we should be able to do so. You say it has become easier, but the general complaint is that many business people, especially those in the small and medium enterprises, find everything about GST confusing. Why is it so? People who are complaining now are the ones who did not pay taxes earlier. They also have not done any online transaction. That is why they do not know the nitty-gritty of how things work. But people who have been paying taxes and those who are already in the system find it much easier. It's like giving a computer to a person who is used to a typewriter. That person will find everything about the computer confusing, initially. Another criticism which the PM himself acknowledged is that the MSME sector has been badly affected because of the confusion in GST and that is why growth has come down to 5.7%. Yes, we have also found that our growth has gone down. Mukunda Foods also has been affected quite badly. Compared to last year, our sales have come down by 50 per cent. It could be because of the economy going down. The hunch is that the economy is going down because of GST. I feel nobody can say that for sure. Sales are affected for everyone except e-commerce. B2B sales have decreased across all the sectors. But it's not because we find GST confusing or we find it is difficult to file returns or find it difficult to purchase or sell. Our growth is down because the ripple effect has affected us also as distributors are not purchasing new stock. What do you want the government to do to revive the economy? I don't think there is a quick fix to revive the economy. What the government has done to stop illegal payments etc is in the right direction. Similarly, they do not ask for bank guarantee for exports. It will take 2 to 3 quarters for those in various sectors to realise that this is the reality and start working towards adapting to this reality. The reality is that we have to pay taxes, conduct online transactions, pay income tax, pay provident fund etc. When people adapt to all these, things will get back to normal. I feel it will take 2 to 3 quarters to get things back to normal. Critics say business could not take demonetisation and GST. Demonetisation did not have a huge negative impact on the economy. In fact, after demonetisation, sales increased because everybody wanted to spend money. But when GST happened, everybody wanted to withhold money. That's because they didn't want to pay taxes. Those who are looking for loopholes find it difficult to adapt to GST. 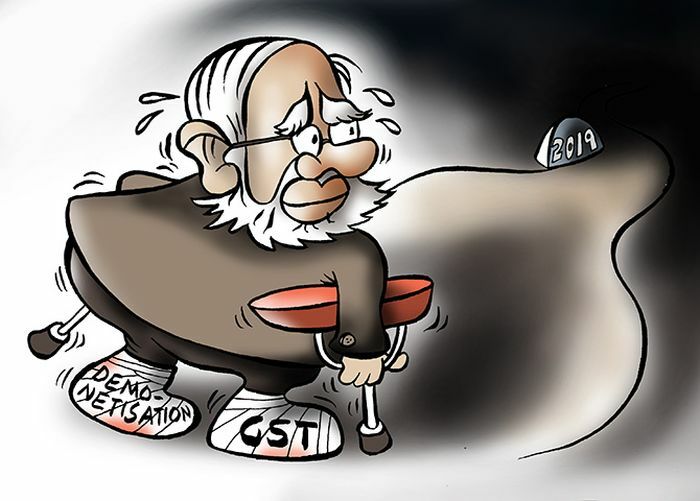 Do you agree with the criticism that the government did not prepare itself well before implementing GST? Kids who had been winning by playing a game without any rules may find the new rules imposed suddenly irritating. They may find it difficult to win with rules in place as they were winning because there were no rules at all, and they even cheated to win. The real players with stamina will learn skills, adapt and start playing. Once that happens, the whole team will start playing well. This is the attitude of those who criticise GST. These people have to adapt to the new system. If you were the finance minister, would you have implemented GST in a different way? If I had that option, I would have implemented it in a different way. I would have taken sector by sector or state by state. For example, I may start introducing GST with the textile industry which has a huge market in India. It's like how we launch a new product in the market. We test the market in an area and see how it is accepted. We don't launch a new product in the entire market first. We also should have started with companies with a certain turnover and then moved forward. Slowly and steadily, people would have accepted the change. Many are extremely unhappy with the different GST rates. 18 per cent is considered a very high rate by all. What do you say? We also feel that 18 per cent is too high a rate. Previously, our taxation rate was 14.5 per cent, now in some places, it has gone up to 28 per cent. One third of our sales is taxed. I feel it can be reduced by 5 to 6 per cent. Then people will be more interested in paying taxes. A major deterrent is the high tax rate, no doubt about it. I think everybody is paying higher taxes post GST. When we have to charge higher tax, our machines become costlier. The original cost of the machine is Rs 180,000 and with 18 per cent tax, the price has gone up to more than Rs 200,000. There is no alternative here. I would also say that it shouldn't be a limiting factor to start a business. You can take the help of a company secretary and s/he may charge Rs 20,000 to help you out. Yes, it is definitely difficult if you have to do everything by yourself, but if you are a passionate entrepreneur, you will take the help of a professional. Then, it is not difficult. Yes, our R&D has always been active. Doubhbot is designed for the cottage industry so that women and self-help groups can make ready-to-use chapatis in bulk and sell them in the market. The product is reasonably priced and would work wonders for this industry. We want to be the backbone of the cottage industry just like Lijjat Papad helped thousands of women by making papad. You have a start-up that is making things in India. Has the Make in India programme helped you in any way? I don't know about other companies, but we have not benefitted at all, not even an iota from Make in India or Start-up India. We were the only start-up company in manufacturing in the Make in India Forum, which had around 50 to 60 companies. There are quite a few start-ups in manufacturing and the government can do a lot by helping all in capacity building, and many other things, but nothing has happened. Why do you think it has not happened? It is not the bureaucracy; there is no policy as such to help start-ups in manufacturing. They say there is a single window clearance if you want to buy land, environment clearance, etc. But why does a start-up need to buy land, electricity? We don't need all that, we only need small things. In fact, we have put all these suggestions to the government and I hope they will start working on it. 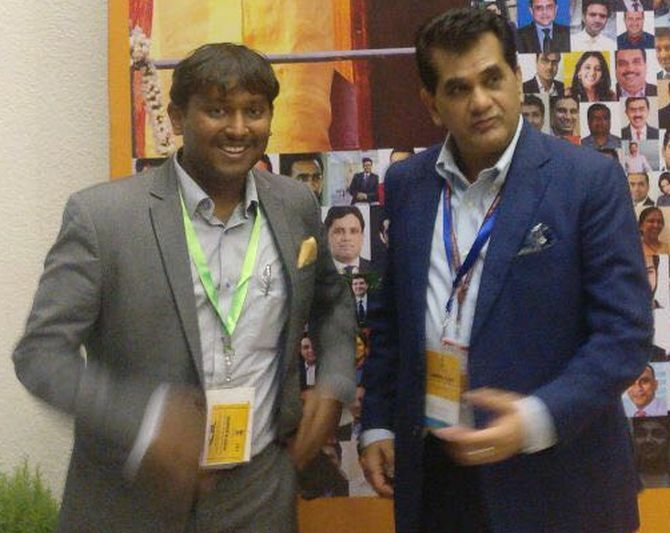 IMAGE: Eshwar K Vikas, left, with NITI Aayog CEO Amitabh Kant. You were invited to have lunch with the prime minister and finance minister. Could you explain the realities to them? Were they open to listening to your opinion? It was a 2-day programme and yes, they were quite open to listen to our problems. In fact, they are aware of some of the problems and challenges. They are trying to resolve the problems too, but it is not possible to resolve the issues overnight. We hear that our proposals have been sent to the relevant ministries and they have already started working on them. They invited some of us including the CEOs of Maruti, Apollo, Panasonic to meet NITI Aayog officials and the meeting happened on October 9. If the first meeting was on a broader basis, this time it was about the nitty-gritty and evolving them into policies. At the meeting, everybody spoke about their dissatisfaction over GST. The wider sense was that GST was not implemented properly. The consensus was there had to be a simpler tax slab and not a multi-layered one. Everyone also agreed that job creation was not happening. The officials from NITI Aayog were receptive to what we were saying. Do you think there is a strong urge in the government to make these things work at the ground level? Definitely. There is an urge in them to implement the ideas. There is no inaction, lot of action is happening. I am happy that they are trying to do something. Faster and quicker is not the solution. Nothing can be done quickly. The roadmap is quite visible. I feel that since they know the problems, in the next 2 to 3 quarters, these problems could be resolved. But they should realise that things are not working well right now. Are you hopeful as a young entrepreneur? I am definitely hopeful. I feel in the next 2 to 3 quarters, it will be back to normal. Honestly, does India need a stimulus package?